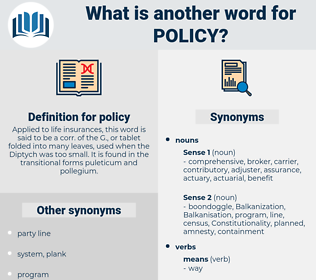 What is another word for policy? Applied to life insurances, this word is said to be a corr. of the G., or tablet folded into many leaves, used when the Diptych was too small. It is found in the transitional forms puleticum and pollegium. commitments, factors, scenarios, proposals, representatives, conventions, Records, arrangements, Agencies, Measures, options, Rights, tools, powers, files, comments, shares, obstacles, headings, aspects, Territories, rows, barriers, payments, TBS, results, Bodies, Les, sheets, women, heads, goods. encouraging, operating, coming, standing, reducing, Doing. implemented, selected, motivated, built, desired, pursued, Reached. approaches, includes, Comes, operates, remains, reaches, Does, Measures. 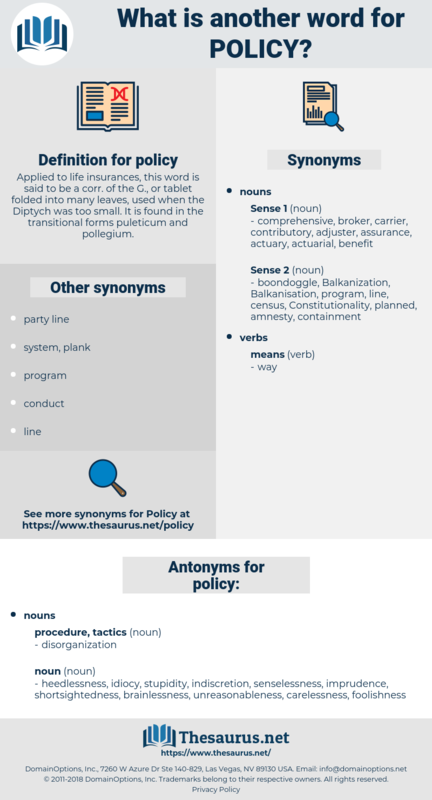 politics, institutions, requirements, norms, Achievements, trends, policymaking. heedlessness, idiocy, stupidity, indiscretion, senselessness, imprudence, shortsightedness, brainlessness, unreasonableness, carelessness, foolishness. Do they throw in a policy for that? This is the German policy. obscurantism, thatcherism, beggar-my-neighbor strategy, Ultramontanism, beggar-my-neighbor policy, Centralism, beggar-my-neighbour policy, beggar-my-neighbour strategy, moderationism, activism, containment. foreign policy, social policy, Clericalism, plank, economic policy, zero-tolerance policy, zionism, party line. logical argument, line, line of reasoning, argument, argumentation.